The College of Winterhold is a school of the arcane arts. The College of Winterhold is located in the northern city of Winterhold. It functions much like the Mages Guild in Oblivion or Morrowind, except in it being a singular and completely independent establishment. The College has struggled to maintain its prominence in Skyrim in recent years for a number of different reasons. The Nords, already skeptical of magic, have become increasingly suspicious of the College because it came out unscathed during the Great Collapse that largely destroyed Winterhold. Additionally, while the College maintains standards for what kind of activities are allowed on campus, in contrast to the Mages Guild, it regards Necromancy as a viable arcane practice. The College is a very secure and selective school, only allowing entry to those they deem worthy. An Altmer sorcerer named Faralda guards the entrance from the main part of Winterhold to the College and warns you that you will likely not be allowed entry. Despite this warning you will never be refused entry after completing the minor task she sets. The College itself, a large fortress-like structure, is located atop an apparently precarious rock formation, in the shape of an upside-down pyramid. It is connected to the city of Winterhold by a long stone bridge with several focal points along its length. Portions of the bridge have crumbled away into the sea below leaving a section that is easy to fall from. The College is sealed by a large gate with the top wrought into the shape of the College symbol as depicted on their banners. There is an identical seal set into the ground at the start of the bridge. The College consists of three structures separated by a central courtyard featuring a large statue of a mage, and connected by walkways at ground level and along the top of the walls that surround the complex. The main building contains a library, called the Arcanaeum, the Hall of the Elements, which is used for all kinds of magical practice and serves as a lecture hall, and the Arch-Mage's quarters, the residence of the head of the College . Accommodations for students and faculty members are provided in the Hall of Attainment and the Hall of Countenance, respectively. Beneath the College complex lies the Midden, an underground remnant of the College's past. Entry is gained into the College by telling Faralda what you seek to learn and then casting a spell of her choice. If you are on the quest Elder Knowledge, you can choose to demonstrate a dragon shout instead. Alternatively, she can be persuaded if your speech skill is high enough. After proving your worthiness, she will guide you into the College and refer you to Mirabelle Ervine to begin your apprenticeship. Note that Faralda does not always demand the same spell. She will randomly ask you to cast one of the following spells: Fear, Firebolt, Magelight, Healing Hands, or Conjure Flame Atronach. If you do not already know the spell she demands, she will offer to sell it to you for 30 gold. Saving before talking to her is recommended in case you do not have the magicka to cast the required spell, allowing you to reload until she chooses a spell that you can cast. # No longer a resident after completing Arniel's Endeavor quest. † No longer a resident after completing The Eye of Magnus quest. * Becomes a fence only after completing the Hard Answers quest. ‡ No longer a resident after completing The Staff of Magnus quest. % No longer a resident after initiating the Containment quest. The College of Winterhold is staffed by teachers who also serve as spell vendors for the skill they specialize in. While they are willing to train you and buy and sell various items, they will only sell you spell tomes based on your corresponding skill level. For example, if you are interested in buying the Invisibility spell book, you will need to have an Illusion skill level above 65. The mages at the College hold various lectures, most between 2pm and 3pm. If there is any danger at the College (such as a dragon attack), then a lecture will not occur for the next 24 hours. The lectures all take place within the Hall of the Elements. "The existence of so-called "Doomstones" throughout Skyrim has been repeatedly verified. The meaning of these stones has not. The prevailing opinion of Skyrim natives is that the stones are indeed magical in nature. While there is no direct evidence of this, it does seem likely. References to similar stones appear in lore throughout the various Tamrielic cultures. None, however, exactly match the markings or distribution of Skyrim's stones. At present, there is no confirmation of any of the various theories surrounding the nature of these stones. Their relative positions do not indicate that any individual stone is part of a larger, unobserved pattern. Also, their placement throughout Skyrim does not correspond to any known magical phenomenon. The age of the stones themselves has yet to be officially determined. It has been widely assumed that they were placed during the Merethic Era. Writings from that period, including those of Ysgramor himself, do not mention the stones and thus this idea cannot be verified. Nonetheless, many are drawn to these stones based on the local stories describing them as a source of significant power. The College will continue to research these intriguing objects, and of course any findings will be relayed with all possible haste." "It is no secret that both the Synod and the College of Whispers have recently made inquiries as to the status of our College here in Winterhold. At this time, there is no indication that either group is aware of the other's correspondence. The College of Winterhold has thus far declined requests for direct meetings. This has been at the specific request of Arch-Mage Aren. Aren believed that although the initial communications were innocent enough, they were sent with a particular motive in mind. The Synod's harsh rules and draconian structure are maintained only by suppressing any opposition to their Council's policies. It is entirely possible that they look to our College here in Winterhold in order to find supporters for their organization. Likewise, the College of Whispers has long been driven by its desire to directly oppose the Synod. They focus on research banned by the Synod, such as Conjuration and Necromancy. The College of Whispers hopes to learn that our College also supports these avenues of research. Thus they may claim that the Synod is indeed a political minority in the Empire and should be treated as such. Our actual position and policies are irrelevant. No matter the facts of the response, it will certainly be twisted to suit the whims of either group. Indeed, it has been jokingly suggested that we send the exact same response to both, which each will warp into support for their side. At present, these two groups do little beyond attempting to gain the attention and favor of the Emperor. They appear to have little interest in real study and research for the sake of gaining knowledge. Arch-Mage Aren believes that their conflict poses a significant threat to the autonomy of our College, and I concur. Falling in with either would threaten to draw much unwanted attention to our College. If either group goes through less official channels and attempt to contact you directly, please refer them to the College's Master Wizard. Say as little as possible so as to avoid compromising our neutral position." "At this time, I would like to make a few statements regarding policy here at the College. Please refrain from practicing Conjuration spells in view of the town of Winterhold. Atronachs have a tendency to frighten the locals. Undead.... well, I don't even think it needs to be said. Urag has asked me to remind everyone to please return materials borrowed from The Arcanaeum in the same condition as you received them. If this is impossible due to misuse or accident, Urag recommends finding a replacement copy to deliver to the Arcanaeum. Failure to do so will result in paying, in Urag's words, "a blood price." I did not ask him to elaborate on that point. Once again, I must ask that everyone please clean up any materials used in the common areas. We've had yet another sprained ankle due to soul gems being left on the floor. Let's please try and keep injuries to a minimum. The Midden remains off-limits at this time; while the initial outbreak has been cleaned up, the area is still considered hazardous. No more experiments are to be carried out there, and mages are advised that you enter the Midden at your own risk. While Drevis appreciates the spellcasting skill that went into somehow cramming several hundred apples into his pillow... He would ask that it please not happen again. He has suggested that, should he find out who is responsible, he is well versed in making things disappear permanently. There have been unconfirmed reports that someone has been sneaking into the town of Winterhold while invisible, and causing... issues. This goes quite against College policy, and the party responsible is advised to cease these actions at once. Any information as to the whereabouts of the previous group of Apprentices would be greatly appreciated. As of yet, there has been no sign of them." "Projects are underway to discern the origin and nature of the College's recent find in Saarthal. Any and all theories are currently being considered. Those with ideas should please speak with Mirabelle. At this time, there is no indication that, as has been rumored, the object is in fact a physical part of Magnus, the god of magic. It has been suggested that the object is a gateway to the realm of Aetherius, but nothing has proven that idea one way or the other. It has been proposed that the object is in fact the entirety of Aurbis in one physical space. This would of course mean that Tamriel, indeed all of Mundus, is actually contained within the sphere. It further suggests that we are somehow then outside our own existence while looking in at it. While the idea seems dubious at best, it has not, at present, been entirely ruled out." "As many know, there is an ongoing effort to research the work of the Archmagus Shalidor. He is most remembered for his great maze of Labyrinthian, said to hold "Glamoril", or the secret of life. While stories have persisted since the First Era, none have ever confirmed the existence of this "Glamoril" or its purpose or function. The College has developed some theories, however. We know that Shalidor had an understanding of magic that surpassed almost any of either his age or ours. The few works of his that have been recovered suggest that he had an understanding of magic and the world that few have ever achieved. What is interesting is that it appears he was also incredibly prolific, writing on a diverse array of subjects. An array so great, in fact, that it remains a source of curiosity. What, then, of this Glamoril? It means "secret of life" in elvish. Could this be an explanation for Shalidor's works? Is it possible that it somehow contributed to his work? Perhaps allowed him to life [sic] multiple lifetimes in a short span of time? Increased his intelligence and knowledge in ways unfathomable to us? We may never know for certain. The College is always searching for more of Shalidor's writings in an attempt to understand both our knowledge of the man, and of magic in general." J'zargo's Experiment: Help a student test out a fiery new spell. Out of Balance: Purify the focus points for magical energy around the College of Winterhold. There are two iron ore veins near the College. Instead of taking the ramp to the gate, walk around to its right. One vein is a short distance ahead, while the other is further up to the northwest. For those unable or unwilling to undergo the initiation test given by Faralda, the College can be indirectly accessed through the cave opening of the Midden. This gives non-initiates access to most of the College's benefits. Be careful when fast-traveling to the College on horseback, as you will spawn on a narrow section of the bridge, making it easy to fall off and die if you are not careful. With the Wild Horses Creation, your tamed Unicorn will return here if you switch to a different mount. 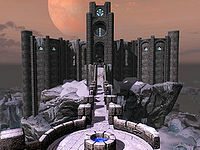 The College of Winterhold also appears in Legends, in the Return to Clockwork City storyline. The stairways between the Hall of Elements, the Arcanaeum, and the Arch-Mage's Quarters act in strange ways. Entering from the ground floor, both the Arcanaeum and the Arch-Mage's Quarters seem to be on the floor above, in an arrangement that would have them both occupy the same physical space. There are stairs that lead between the two, however. This may be a bug in the links between cells, or an intentional extra-dimensional oddity of the College. This glitch also messes with an NPC's pathfinding abilities, forcing them to travel through the Arch-Mage's Quarters when they need to travel between the Arcanaeum and the Hall of the Elements. There is a huge black square in the sea northeast of the College.